I am a big believer in recycling, especially when the end result is so cool. Check out some of the SS16 line from Reclaim Bags and see for yourself. Amp up your everyday bucket bag with Reclaim Bags’ Large Oden II. This bag puts a funky twist on a classic with it’s recycled rubber exterior and rockin’ fringe detail. 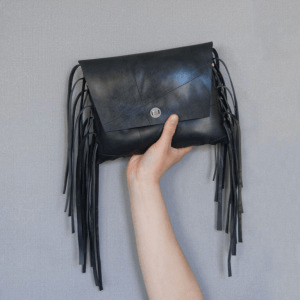 Keeping on the fringe theme (I loooove me some fringe), take a look at the Square Aida Clutch Tassel bag. This is a nice sized clutch bag with a magnetic clasp and rubber fold over to close….and fringe. Did I mentioned I liked fringe? Ok, so I realize that everyone may not like fringe as much as I do, so for those of you who fall into this category, here is the simply chic Mini Aida Clutch. This clutch is a bit smaller than the Square Aida Clutch Tassel bag, but still roomy enough for all of your essentials. So maybe you’re not in the market for a new handbag but really want to help the environment and look stylish at the same time, well Reclaim Bags has the perfect thing for you. The Small Aida Purse is a compact bag with a magnetic clasp and rubber fold over closure that is the perfect wallet size. Reclaim Bags has a variety of other designs available so if you are interested in helping to save the environment these bags are a fashionable way to do it! Cute and very cool that they are made from inner tubes!